Check Rates & Availability at Hilton Waikoloa Village! Daily Resort Charge will be added to the room rate and includes Guest internet access/ hula/ lei making and ukulele lessons/ in room PlayStation 3 with unlimited movies/games/ 20PCT disc On Lagoon Beach toy rentals/ 10PCT disc on Cruises Ocean Sports/ local and toll-free calls. Daily Resort Charge will be added to the room rate and includes Wi-Fi hula lei making - ukulele lessons. PS3 movies/games. 20 off Lagoon toy rental. 4x8 keepsake photo. kid pool activities/scavenger hunt. daily fitness/yoga class. bird talk. 10 off Hawaii Nautical Sail. local/toll-free calls. Situated along a nine-mile stretch of the sunny Kohala coast shoreline Hilton Waikoloa Village is a unique resort like no other in Hawaii. Nestled around Waiulua Bay our Big Island Hawaii hotel features numerous special touches such as a four-acre swimming and snorkeling lagoon with protected sun-drenched beach exotic gardens trams canal boats and more than 1 800 pieces of art along a museum walkway. 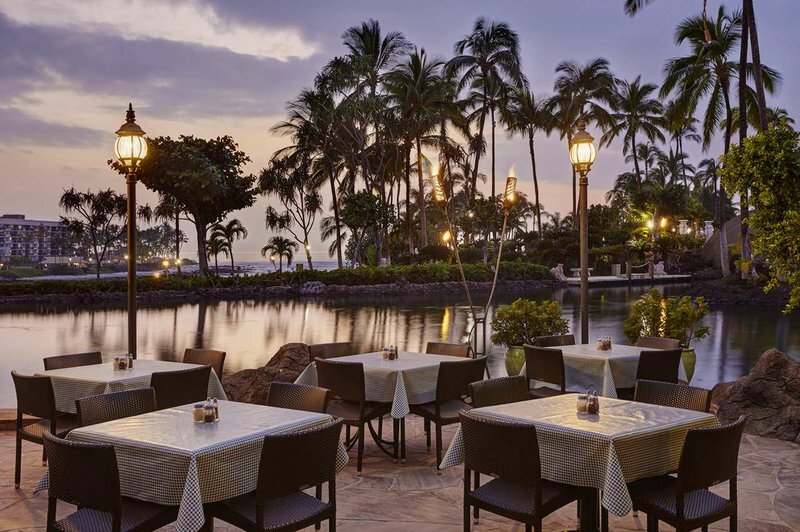 Offering breathtaking tropical gardens abundant wildlife tranquil waterways and impeccable Hilton service our Waikoloa Hawaii resort is truly a destination in itself. Our guest rooms and suites are located in the Palace and Lagoon Tower. Enjoy our three freshwater pools two with waterfalls and waterslides and relax in the world class Kohala Spa the Big Island*s exquisite destination spa. Our 14 distinctive restaurants and lounges will keep you satisfied with options for every palate. Go for a round on our two championship golf courses. Other notable features include a 432-seat stadium tennis court an oceanside wedding pavilion and chapel. With an exciting array of 16 craft and domestic beers on tap and casual fare it*s the perfect spot to cure what ales you. Proudly serving locally made ice cream. Featuring scoops shakes and sundaes. Big Island Breakfast at Water*s Edge offers lavish breakfast buffets and will tempt you with freshly baked pastries fresh island fruits traditional American fare and a selection of Japanese specialty dishes. Ala carte fare is also available. Creative island cuisine. A breathtaking view provides the perfect atmosphere for a memorable dinner featuring fresh locally grown ingredients as well as fresh fish shellfish and steak entrees. Due to later spring sunsets the restaurant opens at 530 pm after February 14 2016. Reservations recommended. Casual dining next to the Dolphin Lagoon. Lagoon Grill serves the best burgers hottest hot dogs greatest sandwiches freshest salads and favorite tropical concoctions and smoothies. Serves lunch and dinner. Enjoy a wide variety of favorites such as wood fired pizzas deli style sandwiches panini fresh salads and fruits and much much more. Orchid Marketplace is located next to the Kona Pool. A CREDIT CARD GUARANTEE IS REQUIRED ON ALL RESERVATIONS REGARDLESS OF ARRIVAL TIME. INDIVIDUAL PLANS VARY. SEE PLAN DISPLAY FOR MORE INFORMATION.